Span-America’s PressureGuard® Custom Care® surface—based on a long line of innovations—means improved therapy for those you care for. 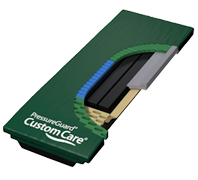 This model is a non-convertible surface in the Custom Care® series which includes the Custom Care® Convertible and the Custom Care® Convertible LAL models. The Custom Care® surface incorporates the cover and outer shell design innovations found in the convertible series, but with a support cylinder design similar to typical non-powered reactive systems. The cover’s enhanced features include the unique design of the anti-microbial bi-directional stretch cover made with Span’s superior LifeSpan® fabric. LifeSpan® is extremely durable and cleanable and delivers outstanding resistance to chemical breakdown caused by bleach and other harsh disinfectants with its polycarbonate-fortified coating. 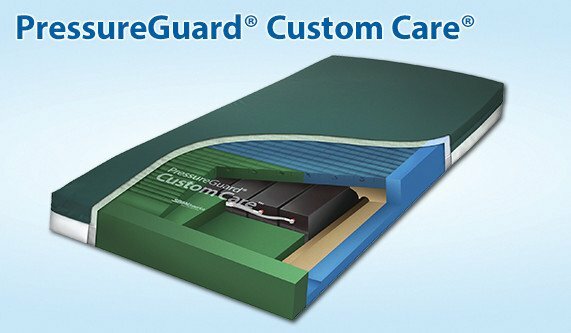 PressureGuard® Custom Care® provides effective, non-powered pressure redistribution through its outstanding combination of a zoned, shear-reducing, engineered outer shell surrounding a reactive support chamber system. Custom Care’s unique Metered Immersion™ design reacts to changes in surface loading through a series of interconnected longitudinal support chambers. As the user moves or repositions on the surface, the chambers below react in concert—deflecting, transferring air, and venting—in relation to the user’s weight and position. The result is a blend of pressure management, shear reduction, comfort, and ease of operation not achievable with other non-powered systems. The recessed deck versions of selected Span surfaces, including the Custom Care, brings our advanced technology to recessed deck beds. Our engineers have developed a version of the Custom Care surface to accommodate the unique design requirements of recessed deck beds. V-shaped edges enable the mattress to fit the recessed deck bedframe, while the compressible section accommodates multiple lengths and foot positions. 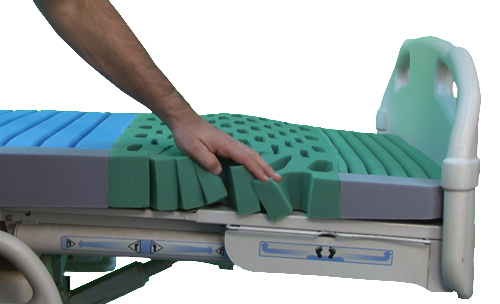 Patented design creates an inner bolster “cradle” effect for added safety when the patient sits on or moves toward the bed edge. This protective feature helps direct the patient’s center of gravity safely back toward the center of the bed. Two sturdy fabric handles improve relocation ergonomics. Weight limit and warranty specifications for the Custom Care Recessed Deck Model same as Standard Custom Care.